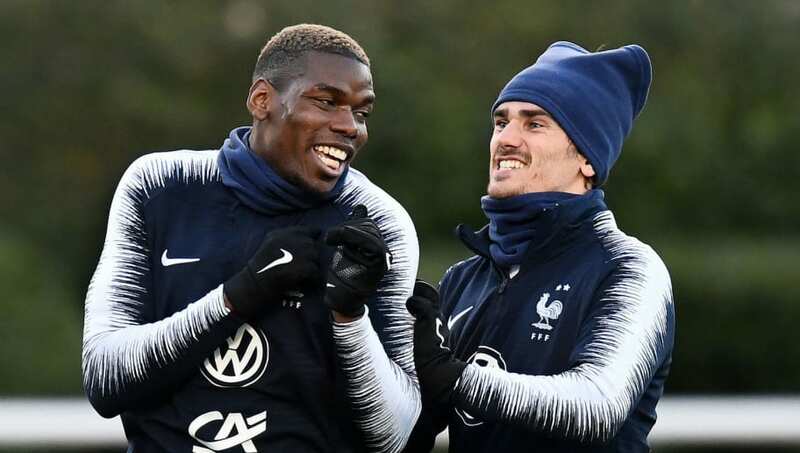 ​Manchester United midfielder Paul Pogba and Atletico Madrid striker Antoine Griezmann have bought each of their teammates an NBA-style Championship ring to commemorate France's success at the 2018 World Cup in Russia. The duo, who are big NBA fans and have been regularly pictured alongside the great and the good from the basketball world over the years, are thought to have come up with the idea last summer. And, after the French federation were reticent to contribute to the expense, decided to fork out the unknown sum by themselves. Reports of the idea emerged last year, but according to ​Get French Football News, the gifts have now arrived as the France squad prepare to take on Moldova and Iceland in their opening two UEFA Euro 2020 qualifiers. Griezmann is understood to have contacted Jason of Beverly Hills, the California-based jewellers that designed commemorative rings for the Golden State Warriors after their 2017 NBA title win and the Los Angeles Dodgers following the 2017 NLCS victory, back in July. And, as revealed by Les Bleus representative Blaise Matuidi on his official Twitter account, the gifts have gone done well within the French camp. Alongside a picture of himself and the ​Manchester United man holding the illuminated boxes containing their rings, the Juventus midfielder wrote: "Unforgettable gift for an unforgettable memory. Thank you from the bottom of my heart for the jewellery ​Paul Pogba." Pogba himself also unveiled the rings in a group photo of all the ring-wearers on his official Instagram, where he gave out a special shoutout to Chelsea midfielder ​N'Golo Kante, who was apparently especially touched by the present. Pogba wrote: "World champion ring and [thumbs up] celebration like N'Golo Kante." France will be aiming to qualify top of Group H in their Euro 2020 qualifying campaign, where they will also play Andorra and Albania.